The new Austrian Chancellor Christian Kern recently cited Mariana Mazzucato and her book The Entrepreneurial State, in which she debunks the myth that innovation originates exclusively from the private sector. Should the Austrian Government refocus itself and live up to its role as a driver of innovation and a partner of the private sector this would certainly be well received. Concepts rooted in hierarchy and complexity increasingly fail. Today, most successes and disruptions are based on cooperation, networks, new technologies and simplification. 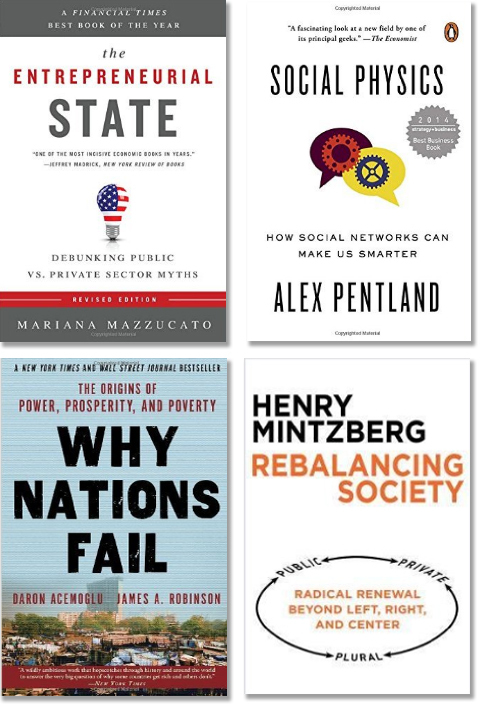 Against this background, the following books besides the one from Mazzucato can serve as an inspiration for (state) managers. During a panel discussion at the Federation of Austrian Industry in March 2016, the CEO of Wikifolio explained that on his platform members publish their trading strategies and that the portfolios there currently amount to fourfold the trading volume of the Vienna Stock Exchange. One of the main questions asked by the moderator was “Why do people do this?” Here the research of Alexander Pentland from MIT in his book Social Physics comes in: Traders alone in their chamber generate the lowest returns, while the ones with publicly shared and discussed trading strategies see the best yield. Same with call centers: Staff who were not allowed to see or speak to colleagues during breaks had the worst turnover, the ones with social interaction during breaks achieved the best turnover. When considering urban areas, Pentland estimates the gross urban product with little deviation based on such indicators. Summarized in one sentence, his findings show that the more cooperation, interdisciplinarity, openness and mingling, the more wealth. The authors of Why Nations Fail collected evidence on what makes and made nations successful (and what exactly did not): Inclusive societies that are centralized and pluralistic and where participation and social advancement can be achieved through engagement and risk-taking, are those which provide the successful cases in the comparative analysis. Extractive systems, on the other hand, are built in such a way that they withdraw resources from the society and provide benefits for a small upper class only. Engagement vanishes once individuals cannot achieve social advancement through work anymore. The conclusion: Extractive systems degenerate, inclusive systems prosper. In Rebalancing Society, Henry Mintzberg advocates policies beyond the left and right ideology and beyond the paralysis in the center. For this purpose, he distinguishes between the private sector (businesses), the public sector and the so-called plural sector (civil society, nonprofit). Engagement and initiative for causes within organizations of civil society and in cooperation with the three sectors are endorsed better by those who were engaged than by those who did not participate. In the context of the refugee wave of 2015 this proved quite clearly to be true. Hence, the success and legitimation of (state) management does not originate from a mandate or position but from mutual participation.